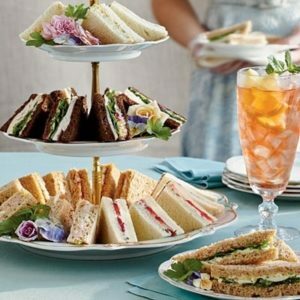 High tea is a popular activity all over the world, especially for special occasions such as bridal showers and birthdays. But high tea hasn’t always been as we know it. In fact, it wasn’t called high tea at all! What was originally known as high tea in England, around 1825, was the evening meal of the working class. Usually eaten between 5pm-7pm it was for workers, who were tired at the end of the day, or the younger family members. It usually consisted of a hot dish, followed by cakes, bread, butter, and jam. The origin of the term high tea is debated to come from two sources; either because originally it was taken at a high table, rather than in a lounge as afternoon tea was, or because it was taken later in the day – the advanced or “high” part of the day. Afternoon tea, on the other hand, is what we have come to know as high tea. While still often referred to as afternoon tea in England, the name high tea has been adopted by most other countries, and is sometimes referred to as that by English venues with international audiences, such as hotels. The creation of afternoon tea is often credited to Anna Maria Russell, Duchess of Bedford, in the 1840s. At the time, it was fashionable to eat a late dinner at around 8pm. The duchess complained of experiencing a “sinking feeling” around 4pm, as a result of such large gaps between meals, and so began eating a small meal accompanied by tea. She soon started inviting friends to join her, and slowly it became a social activity observed by the upper classes. Traditional afternoon tea food included small sandwiches of luxury ingredients, scones with jam and cream, and cakes and pastries. These small delicacies were easy to handle when sitting at a low table in a lounge or salon. Today, we enjoy high tea with the traditional foods, along with a variety of different tea options, a luxury that was not always possible back in the days of the Duchess, as tea could be expensive to import. Some venues also offer champagne or wine, as an extra special treat! Experience Sweet Treat High Tea or a Devonshire Tea for you Everyday at WestWaters.